Eager to energize an early afternoon crowd who were still a bit sluggish from partying down with Iggy Pop and Faith No More the night before, the pulverizing grooves of Exes For Eyes did just the trick in getting everyone amped up for one final festival day. 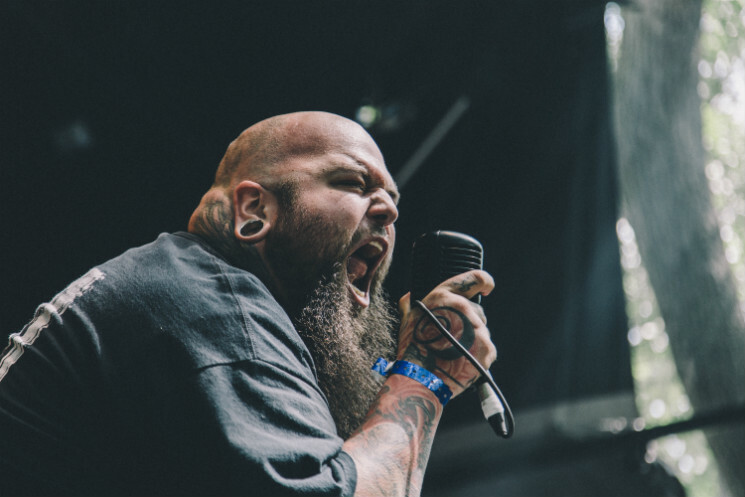 Frontman James Arsenian was the controlling force behind the quartet's boisterous metal assault, with his forceful, gravelly vocals inciting a small mosh pit at the stage front while driving the audience to pump their fists in the air. Packing their half-hour set full, "Feel Again" featured some face-melting solo skill from guitarist Dave Sheldon while also showcasing the strength of their rhythm section, anchored by bassist Graham Porter and drummer Aaron Spink. In managing to sneak a cover of Faith No More's "Collision" into the itinerary, guitarist Sheldon's backing vocals proved a bit pitchy before redeeming himself with some operatic high notes on the band's original "Remember Savannah." Appreciating the crowd's enthusiasm until the end, Arsenian leapt from the stage before one final song to organize "the biggest group hug that Heavy Montreal has ever seen" in celebration of the love and respect within the metal music community.